My daughter is just reaching the stage where she loves to reach out and touch everything within her reach! It is so fun to see her exploring with her hands (and mouth!) and learning new textures, shapes, colors, and objects! A fun toy that is intriguing her and giving her entertainment lately during Tummy Time is the new PlayWow Pat Mat Dinosaur! PlayWow, a new line of colorful and creative inflatable infant, toddler and pre-school products, makes its U.S debut after unprecedented success abroad. This innovative inflatable toy line helps foster physical, cognitive and developmental skills. The Pat Mat Dinosaur is a visual and tactile tummy time activity toy. Just fill it with water to start the fun. 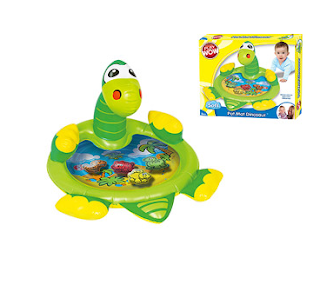 Every time baby pats, the three PlayWow Friends engage baby by swimming and swirling around. The Pat Mat Dinosaur easily empties and folds for take-along fun. With the Pat Mat Dinosaur, my daughter has never had so much fun with tummy time! This adorable dino features 3 aquatic friends that swim and swirl when baby bats at them. I love how it easily folds for take-along fun and can just be wiped clean with a damp cloth. It is recommended for ages 3 months and up. So if you are looking for a fun toy to stimulate your child during play time and tummy time, check out Pat Mat Dinosaur and the other great products from PlayWow! Win It: PlayWow is generously offering (1) Pat Mat Dinosaur to a lucky winner!